This is the Resource page, provided by Margaret Rifkin, for those who are seeking more information about the topics covered in this APA session. How can you set up local government policies for people to initiate and test their own ideas for interventions for walking and biking? What are the issues and challenges of creating a path and crosswalk on existing asphalt, and how do you address them? This session covers these topics and more. How to set up a program for community-initiated demonstration projects to test ideas for improving walking and biking. 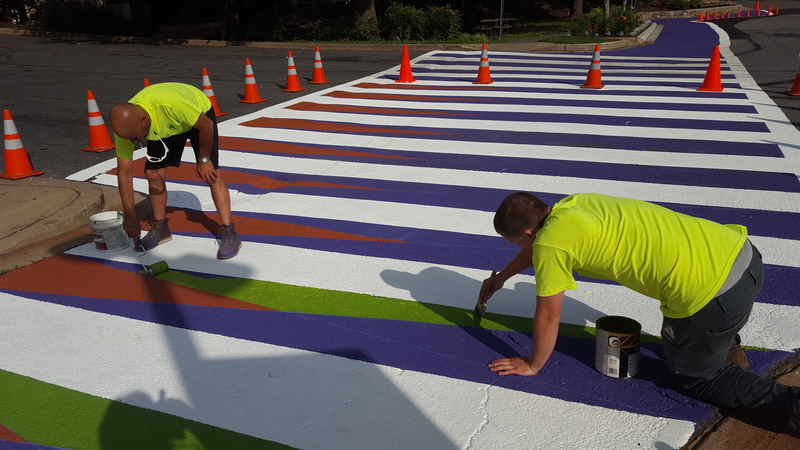 The basics of planning, designing, implementing, and maintaining a temporary path through an existing parking lot and an artistic crosswalk. 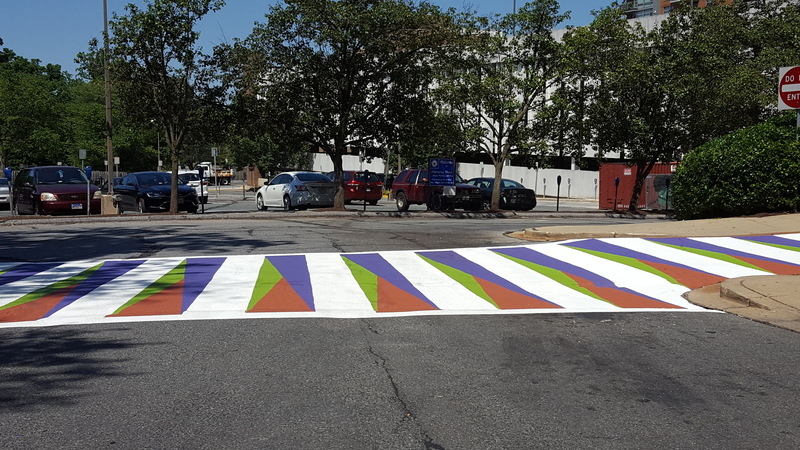 What is the MUTCD manual, and why does it matter? 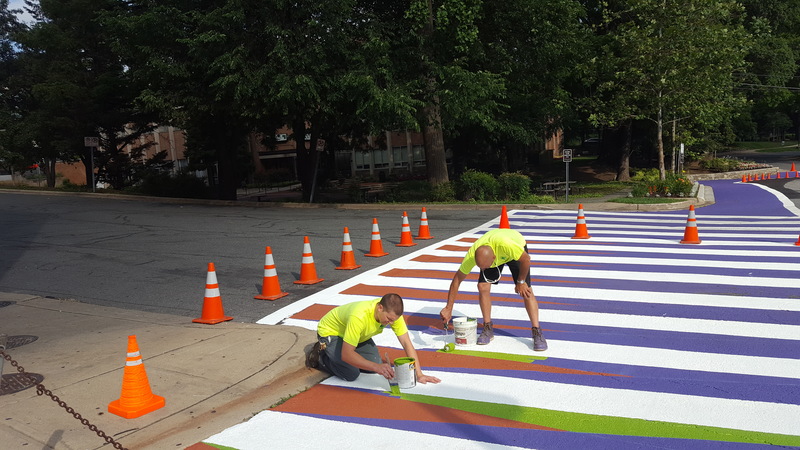 How to find and follow best practices for such projects based on the Manual on Uniform Traffic Control Devices (MUTCD). Why are safety and design considerations such as color, texture, patterns, and posts important? More Great Info about the topic! 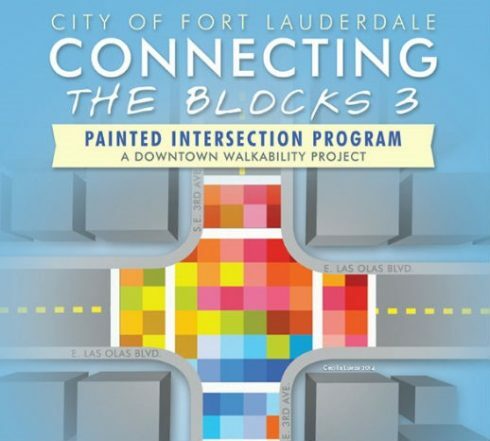 Pinterest Board showing Crosswalk Art found on the web: see the Pinterest page of “Margaret K Rifkin RLA AICP”. Find out how to join Pinterest here. Manual on Uniform Traffic Control Devices (MUTCD) 2009 with Revisions 1 and 2, May 2012 This is from the U.S. Federal Highway Administration. This is always being updated and interpreted. It is wise to confirm that you have the most recent information. The section on Crosswalk Design is Section 18. You will need to scroll down to the section. An official ruling from August 2013, that interprets the section is 3(09)-24. Here is the page with the latest news on rulings: http://mutcd.fhwa.dot.gov/. You also need to check to see if your state has amended the MUTCD by adding a supplement or creating a complete State MUTCD. 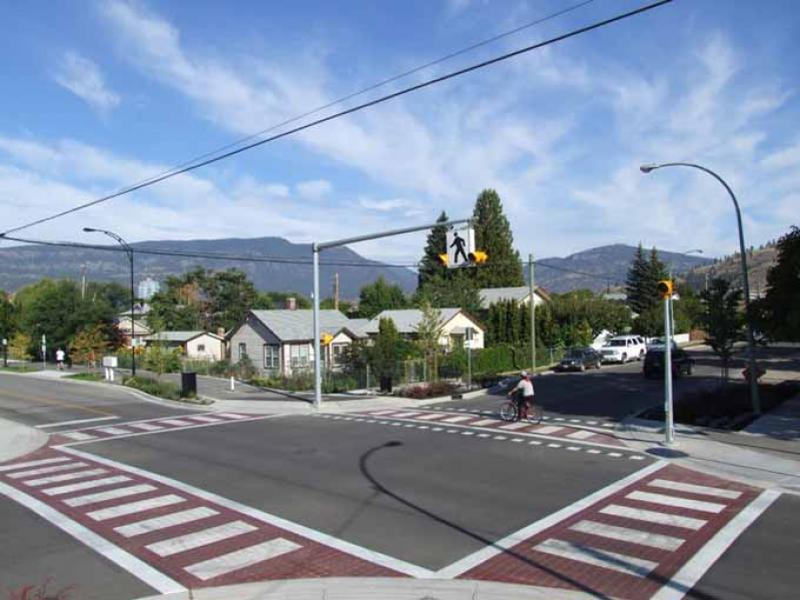 Crosswalk Marking Field Visibility Study: https://fhwa.dot.gov/publications/research/safety/pedbike/10068/index.cfm . This is the type of research that the FHWA relies on. Carlos Cruz-Diez – a portfolio and biography. Roadsworth – Peter Gibson – a portfolio and biography. Christo Guelov – Funny Cross II Torrelodones, Madrid – a portfolio and biography. Crossing the Line – Trailer for Documentary about Roadsworth . The artist’s story about his inspiration, arrest and support from the community. Curitiba City Hall Crosswalk Art 2011 “Now that you’ve taken notice, use the crosswalk.” And a URL. $2,698 for materials: paint and duct tape. 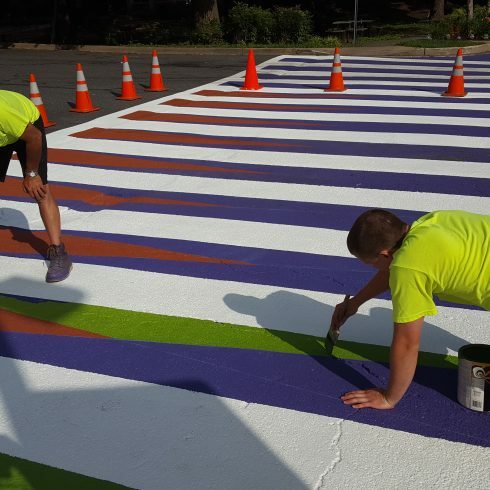 Only the white band nearest the curb is painted with artwork. 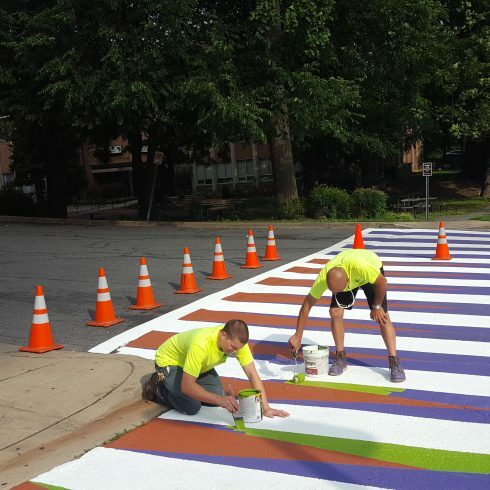 Artist Designed Crosswalk, SENSE Charter School, Indianapolis Indiana 2016 Stencils and paint brushes. Children painting. 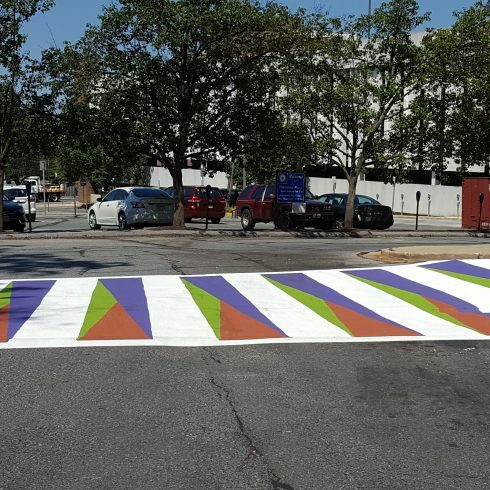 Crosswalk, Sidewalk and buildings as canvases for bold color pattern at a city scale. Serious application of sheathing on buildings and paint on pavement. MEEP Creative Agency 2012 Professional installation technique of piano key crosswalk. Large metal frame stencil. Industrial paint sprayer. Yorkton Business Improvement District. City of Yorkton. artsVest. Milwaukee 2013; Warsaw Poland (Chopin)-2010; Salzburg School of Music – with piano music – 2009; Fort Wayne Indiana, Packard Park – 2016 (Packard Piano and Organ Co.); Hayward CA – Downtown.) Industrial paint sprayer. Shared Street with distinctive pavement. New crosswalks installed in Downtown Cleveland 2017 6000 pedestrians killed in 2016. Governors Highway Safety Association determined 82% of deaths occur outside intersections.ER Doctor attributes it to distracted walking due to cell phone use. 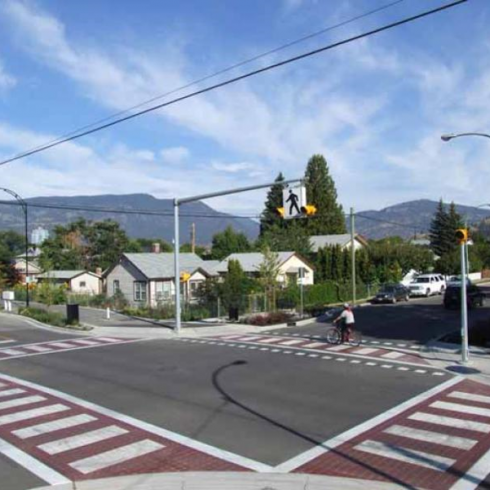 $17,000 per enhanced crosswalk. Signs, buttons and flashing lights at crosswalks.